Laser-induced-fluorescence studies of calcium dimer deposited on large argon and neon clusters have been performed. The spectroscopy of the Ca2 A state is slightly perturbed by the cluster surface leading to shifts and broadenings of the order or less than 100 cm-1. An absorption has been evidenced in the 530–550 nm wavelength range that is tentatively assigned to the yet undocumented A’ 1Pu state of Ca2 correlating to the Ca(1D)+Ca(1S) asymptotic limit. The excited calcium dimer dynamics are very different in neon and argon clusters. The argon cluster is much more efficient for electronic and vibrational relaxation of the excited dimer. Finally, excitation in the blue of the calcium atomic resonance line leads to a competition between dissociation of the dimer with ejection of an excited calcium atom out of the cluster and the relaxation of the dimer to lower excited levels. 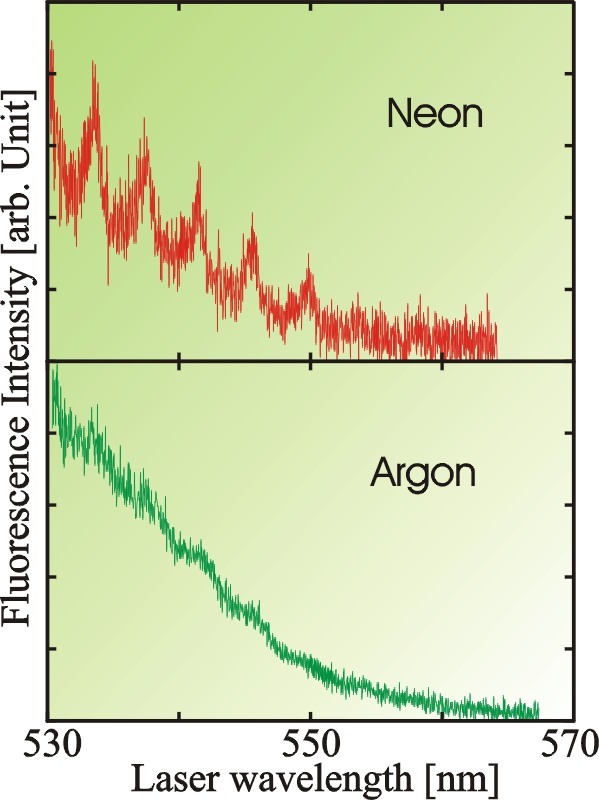 Green excitation spectra of calcium dimers deposited on neon (upper pannel) and argon (lower panel) clusters. The frequency of the laser has been scanned while recording the fluorescence signal at 700 and 750 nm for neon and argon, respectively (maximum of the fluorescence emission). These spectra were assigned to excitation towards the recently documented A’ 1Pu state of Ca2 (see E. Czuchaj, M. Krosnicki, and H. Stoll, Valence ab initio calculation of the potential-energy curves for the Ca2 dimer, Theor. Chem. Acc. 110, 28 (2003)).